Lovely three part dish decorated with the floral border pattern from Cattle Scenery and printed in a light steely blue. Backstamp: Adams Est 1657 Cattle Scenery Ironstone. There is a little minor blue smudging here and there otherwise excellent condition. Wonderful rural scene of not only cattle, but a horse, donkey and sheep with a very pretty floral border around the rim. No backstamp. A little blue smudging here and there, otherwise excellent condition. Lovely pot with moulded detail to the handle and around the body. Backstamp: Laburnum S A & Co There is some wear and surface scratching inside and to the rim but overall excellent condition. Very pretty box in this lovely floral pattern. Backstamp:Poppy S A & Co. The base is crazed with a little discolouration inside with a chip to the internal ridge and two hairlines to the rim. The cover has light crazing and a small chip under the rim. Sounds awful but is a very pretty display piece. This pattern is normally known by the name India, but whether that was the factory name for it or a later given name is uncertain. It is a Chinoiserie riverscape scene. Fabulous pot with 10 sided body printed in a rich blue. Backstamp: Impressed Ashworth. A few minor glazing blemishes but overall excellent condition. Three pieces - base, strainer and lid. The base has crazing with just a very little minor wear around the rim. The strainer is crazed and has some associated staining although this does not affect the rim (the visible part once the lid is in situ') It also has three UNDER rim chips. The lid is perfect except for a small "ding" on the top. It has the prettiest of loop handles. All in all a very pretty piece with little of the damage showing when all pieces fit together. This is a most unusual piece. It has an internal fixed strainer approximately 1.5 ins from the base. Then on one side is a small drainage opening. Light crazing with a small discreet hairline to the rim. Rarity aside it is also a really pretty piece. 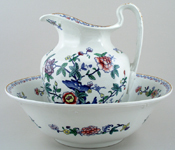 Made by G L Ashworth & Bros, makers of Masons Ironstone. There are 11 scenes in the Lake series pattern and all except one were taken from illustrations by William Henry Bartlett published with text as Canadian Scenery, firstly in monthly parts in 1840 and then in 2 volume book form in 1842. Bartlett's views were widely used by potters, including Podmore Walker for their British America series and Morley's earlier partnership Ridgway, Morley & Wear for their Agricultural Vase series (continued by Ridgway & Morley and Morley himself). Lake was printed in blue, both dark and light versions, brown, green, grey, pink, mauve and purple. There was also a version with gilt decoration. The view on this pot is Indian Scene. This lovely pot is printed in a pale shade of blue, with the main pattern around the pot, border pattern to the round foot and around the rim, and unusually the main scene is repeated on the inside the base of the pot also. Backstamp: Ashworth impressed. Small discreet chip to the base of the handle, otherwise excellent condition. Lovely pot printed in a pale blue. Backstamp: Aurora B H & C There is a little wear and minor discolouration to the rim and a small very minor firing crack where the top of the handle joins the pot. Inside there is a small glazing blemish, overall a lovely piece. Stunning ewer, with fabulous scroll handle and gently moulded body. Backstamp: Triumphal Car, J&MP Bell & Co (a little hazy). Excellent condition. Attractive two part sponge dish - base and pierced top. Backstamp: Alwyne Bisto England. Excellent condition. A lovely three part soap dish - base, strainer and cover. All three pieces in superb condition. Blue printed backstamp Athena Bisto England. 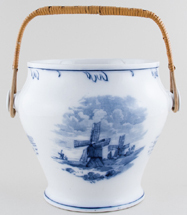 This is a wonderful flow blue chamber pot. Backstamp: Brent above caduceus and Bisto England below and in script 6 143. A little surface scratching inside otherwise excellent condition. Fabulous three part soap dish with base, drainer and cover. There is a little wear to the gilt, some discolouration to the strainer and a tiny hairline to the rim otherwise fine. A most decorative piece. Three part dish, base strainer and cover. There is a little very minor mottling inside the base. The strainer has a firing fault, but this is hidden when it is situ'. The cover shows a few minor signs of age but overall good. This is a very pretty dish. Lovely pot printed in a steely blue with the same three rural scenes around the body and delightful wheat and grapevine border. Backstamp: British Scenery Booths Silicon China England. Excellent condition. 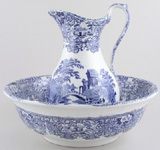 Lovely rural scene printed in a steely blue with ornate moulded handle. This was originally a Davenport pattern and Booths bought the printing plates when Davenport closed in 1887, however they continued to use the Davenport backstamp for some time. Backstamp: British Scenery Davenport. There is a little minor discolouration inside and to the handle, overall in excellent condition. Two part dish, base and strainer printed in a light steely blue. Backstamp: Booths Broads Pattern Silicon China England. An absolutely fabulous ewer with ornate handle and embossed detail to the rim of the spout and all printed in a soft light steely blue. Backstamp: Booths Broads Pattern Silicon China England, impressed Booths and Rd No 443521. There is restoration to the foot rim and a small area of restoration to the rim of the spout. Otherwise this shines like new! Delightful three part dish printed, base, strainer and lid, all printed in a light steely blue. Backstamp: Booths Broads Pattern Silicon China England. A small minor blemish to the lid otherwise excellent condition. 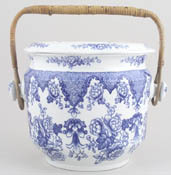 Slop pail with original cane handle, embossed detail around the rim and four pattern vignettes around the body all printed in a soft light steely blue. Backstamp: Booths Broads Pattern Silicon China England. A chip to one side handle and a little minor discolouration inside overall excellent condition. Very pretty box. Backstamp: Indian Ornament TG & FB. (We do not believe this pattern is Indian Ornament however!) Minor signs of wear with a little crazing, overall excellent condition. With gilt. Fabulous pot with hand applied enamel colour. Backstamp: Booths Silicon China England. Gilt very worn around the rim and there is a little minor surface scratching inside otherwise excellent condition. With gilt. A fabulous large ewer beautifully decorated. Backstamp: Booths Silicon China Ming Made England. A little wear to the gilt on the handle otherwise excellent condition. Absolutely stunning piece in this wonderful pattern, complete with cover and original cane handle. Backstamp: Booths Silicon China Ming Made England. There is some wear to the rim and side handles of the bucket otherwise excellent condition. Attractive pot printed in a steely blue/grey with gilt rim and gilt highlights. The body of the pot is fluted. Gilt a little worn on the handle otherwise fine. Black printed backstamp crown over Royal Semi Porcelain, Poppy Pattern, Booths, England. This mark was in use 1891 to 1906. With gilt. Backstamp: Booths Silicon China England Real Old Willow and although not marked it is pattern number 8982. Date of manufacture probably 1916-17. If ever a chamber pot could be described as fabulous this is it. The everted rim is gently indented with moulded decoration, plus an ornately moulded handle, which is highlighted with blue and accented with gilt. The pattern itself has the added decoration of gilt printed butterflies around the body. Toilet ware is rare in Real Old Willow and this has survived in beautiful condition. Apart from light wear to the top rim and a few specks of light staining inside this is as fresh as the day it was made. With gilt. Backstamp: Booths Silicon China England Real Old Willow. Date of manufacture probably 1916-17. A fabulous and beautifully ornate ewer. It has a wavy rim with embossed decoration and a wonderful moulded handle highlighted with gilt and added decoration of gilt printed butterflies around the body. The gilt is quite worn in places, it has light crazing with a little discolouration inside and there is a hairline crack to the body of approximately 4ins Overall an absolutely stunning piece. Provenance: The Entwistle Collection. A three part dish printed in a lovely rich cobalt blue with delightful pretty rose pattern. Backstamp: Booths Silicon China Summer Rose, England. To the rim of the dish there is a small very minor blemish where it touched something whilst in the kiln. The insert has some damage to the rim and the lid a manufacturing blemish on the top. The lid is not a perfect fit. Lovely floral design on this pot printed in a steely blue/grey. The surface inside the pot is quite scratched - probably from over vigorous cleaning! Otherwise the pot is in fine condition. 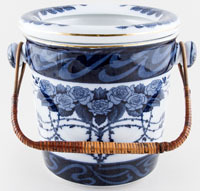 A decorative pot, the lovely rose design printed in a rich cobalt blue. A little minor discolouration to the foot and a small mark on the rim otherwise in excellent condition. With gilt and printed in a soft steely blue. A wonderful slop pail complete with insert and original cane handle. Backstamp: Booths Silicon China Summer Rose England. The pail has light all over crazing with a little minor wear to the gilt and inside a little discolouration. Underneath the insert there is a little loss of glaze to the stilt marks otherwise excellent condition. 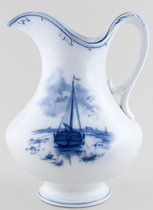 Printed in a dark steely flow blue, with added gilt decoration to the handle and body of the ewer. Backstamp: crown over Royal Semi Porcelain, Summer Rose, Booths, England. Printed in a dark steely flow blue, with added gilt decoration. Light crazing and there is some wear to the gilt particularly on the handle, otherwise excellent condition. With gilt. Fabulous pot with ornate moulded handle. Backstamp: Booths Silicon China England The Pompadour and in script 8123. There is some surface scratching and wear to the gilt otherwise excellent condition. A gorgeous ewer, blue printed under the glaze with hand applied colour. There is a little very minor mottling inside otherwise excellent condition. Fabulous octagonal ewer and bowl. The bowl has pretty embossed decoration around the outside rim and decorated both inside and out. Backstamp: Booths Silicon China Made in England The Pompadour. These Colours Will Not Perish. The ewer is crazed and has some restoration to part of the rim which does not interfere with the rim decoration. The bowl is in excellent condition. This is a magnificent chamber pot with ochre rim, blue printed under the glaze with hand applied enamel colour to the bold floral pattern. In excellent condition. Pattern number in script 8085. Gorgeous three part soap dish with ochre rim. Base, strainer and cover. Backstamp: Booths Silicon China England. The base has just a little light crazing otherwise excellent condition. The strainer is crazed and has a hairline, although neither noticeable when the cover, which is in excellent condition, is in situ'. A lovely two part dish, base and pierced top. Backstamp: Booths Silicon China England Georgian Shape Willow. The base is crazed with a little minor discolouration inside and a tiny hairline to the rim. The strainer is in excellent condition. A lovely three part octagonal soap dish in this Willow variant. There is a small stain inside to the base otherwise all in excellent condition. Blue printed backstamp Booths Silicon China England Victoria Pattern. This may have been applied by mistake as this appears to be Georgian Shape Willow, without gilt or ochre rims. Very pretty pot with very pretty floral design either side of the body. Backstamp: Basket of Flowers Leighton Pottery B & B B. There is a little minor wear to the rim otherwise excellent condition. Lovely floral border pattern inset with scenic vignettes around the inside and outside rim. No backstamp, but this pattern is usually attributed to Bovey Tracey Pottery Co of Devon. Light all over crazing with a few minor blemishes and a little blue smudging here and there. Inside there is hairline which does not go through to the outside and to the foot a very small firing fault. This sounds much worse than it looks! Lovely ewer and bowl with the floral border pattern inset with scenic cartouches. Backstamp: Impressed date for 1860 on ewer. The bowl has light all over crazing with a little brown spotting. the ewer also has light crazing otherwise is in excellent condition. A spectacular ewer in superb condition. Lovely romantic scene either side of the body with a very pretty wide floral border pattern all around the rim both inside and out. The final touch is the pretty floral decoration along the line of the elegant handle. No maker's backstamp, but normally attributed to Bovey Tracey Pottery Co of Devon. Lovely scene either side of the body and inside to the base, of an arched bridge flanked eitherside by paladian buildings and waterfalls. Backstamp: Impressed W. This pattern is usually attributed to Bovey Tracey. Signs of wear and light discolouration mainly to the foot, rim and handle. Inside a small star hairline which does not go through and some glazing blemishes and underneath a chip to the foot rim. Sounds much worse than it looks! Bridgwood and Clarke of Churchyard Works, Burslem, active 1857 to 1864. This large wash bowl would have been part of a toilet set. Fundamentally in good condition, the stilt marks are evident and swirled moulding of the bowl has resulted in minor stress cracks. Looks fine on display. Blue printed cartouche backstamp with Terrace and initials B&C beneath. Two part dish, base and pierced strainer which is decorated on both sides. Backstamp: Impressed Brown Westhead Moore and registration pad for 1873. Light crazing otherwise excellent condition. This is a wonderful piece, complete with its cover and original cane handle. It is in superb condition. Blue printed backstamp: BWM & Co Douglas Cauldon England. Made by T C Brown-Westhead, Moore & Co. This box with cover is printed all over with a version of their Flowers and Leaves pattern, which was also used on wall tiles. Whimsically, one wonders if you could have had a bathroom or bedroom wash-stand with tiles to match your toilet set, of which this box would have formed part. These boxes are also known as toothbrush holders. Gilt decoration shows only a few signs of wear. Excellent condition. Impressed backstamp T C Brown-Westhead Moore & Co and pattern number D3548 in red script. D signifying it is from the toilet ware range of patterns. Also raised pad diamond registration mark for 10 November 1873, when Brown-Westhead registered toilet ware shapes under design number 278169. With gilt. Lovely box, decorated with the fruit and foliage of an apple tree. Backstamp: Rd No 1920 Depose and under the cover impressed Brown Westhead Moore. There is some wear to the rim of the base and to the gilt on the finial and the occasional manufacturing blemish. A two part dish with the strainer being patterned both sides. Backstamp: BWM & Co Indian Empress, registration mark for 1877. The base has light crazing and to the rim and inside some discolouration. The strainer has a tiny hairline running from one of the holes otherwise is in excellent condition. Two part dish, base and pierced strainer which is decorated both sides. Backstamp: BWM & Co May, Royal Crest and impressed Brown Westhead Moore. Diamond registration mark on pad for shape, which is for 10 November 1873 and Patent No 278169 and Parcel 7 in respect of design for toilet ware. The base has a little wear to the rim, a small manufacturing fault to one handle and surface scratching inside. The strainer has light crazing otherwise is in excellent condition. This is a very pretty piece.